Pre-shrunk, 100% cotton. They are "unisex" sizes, so think "men's" sizing. 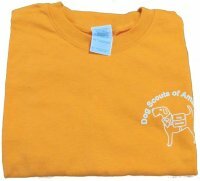 These are usually available in the standard "Dog Scout Red," but we usually have other colors available (like the tangerine, pictured in the photo), for people who donâ€™t like to wear red. The logo is silkscreened in white.